If one moment summed up the spirit of this festival, it came during the spellbinding concert by the Coltranesque saxophonist Carlos Malta. In the stunning if less than pristine Baroque setting of the Convento de São Francisco, every pew was filled, leaving a crowd standing outside to eavesdrop while braving the occasional tropical downpour. Eager to share his music with everyone, Malta (whose concert paid tribute to the Afro-samba partnership of Baden Powell and Vinicius de Moraes ) wandered down the aisle in mid-solo, eventually stepping outside as his group continued playing. Churches and music are intertwined in Olinda, a Unesco heritage city, once the colonial capital of the northeastern state of Pernambuco and now a suburb of Recife. 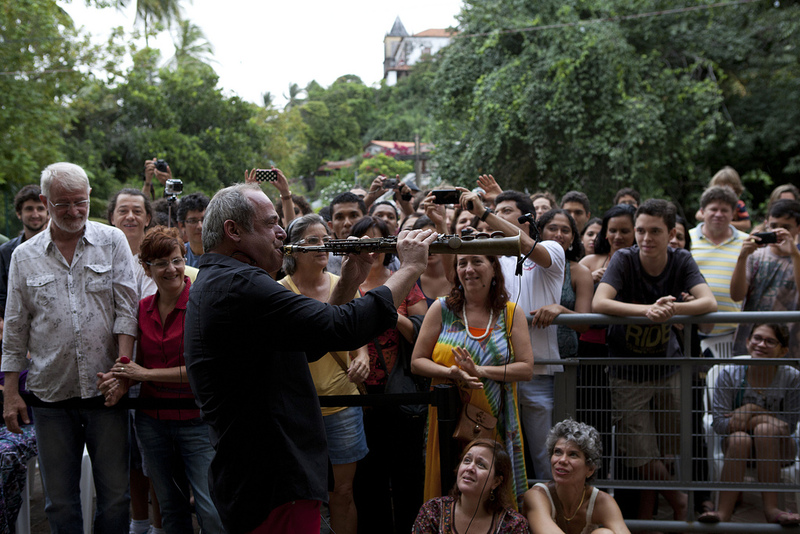 Launched a decade ago, MIMO (Mostra Internacional de Música de Olinda, or International Music Showcase of Olinda) set itself the goal of bringing new life to the cluster of venerable buildings. Part of a large French contingent, the accordionist Richard Galliano edged across boundaries at the Igreja da Se, on the hill overlooking Recife, in an exuberant, bare-bones performance of Vivaldi’s Four Seasonsalongside the Quinteto da Paraiba. There was no flavour of the lollipop about the arrangement. An ecclesiastical setting did not work quite so well for the Cuban pianist Omar Sosa at the neighbouring Seminário de Olinda. A musician with a taste for dense, percussive textures, Sosa locked into an overpowering series of riffs ill-suited to the acoustics. There was more subtlety on display in the Igreja da Se meeting of Brazilian mandolin virtuoso Hamilton de Holanda and the impish Italian pianist Stefano Bollani. True, Bollani can be too playful for his own good, but de Holanda’s ability to blend the rhythms of choro and that local speciality, frevo, brought a greater sense of depth. Down in the main square, Gilberto Gil presided over a boisterous late-night show alongside the young musicians of the Orquestra de Sopros da Pro Arte. It was almost three in the morning by the time they signed off. Alongside the concerts ran an open-air film festival. The highlight was Tropicália, Marcelo Machado’s richly detailed documentary about the counter-cultural movement of the 1960s. Gil and his friend Caetano Veloso, eloquent as ever, recalled how their opposition to the military dictatorship landed them in exile in London: the footage of their appearance at the Isle of Wight Festival was fascinating. They started out as pop stars; harsh experience turned them into mature artists.